Men’s soccer broke its five game losing streak with a 2-1 away win against Compton College Friday. The Huskies improved their record to 4-9-2 overall, but still stand last in the South Coast Conference-North, with a record of 1-3. East Los Angeles College came back at the last minute with a goal from sophomore forward Jerson Maravilla to win the game. Husky freshman midfielder Alberto Gutierrez took the ball to the the right wing and outran a Compton defender to give Maravilla a touch-in to seal the victory. “We were slacking off in the beginning. In the second half we stepped it up more. I’m excited with the deciding (goal) to put the team up and win the game,” said Maravilla. Maravilla was subbed off,after he scored the winning goal, due to a slide tackle that he received after shooting the ball. “He (Maravilla) puts the team on his shoulders as much as he can, but overall it’s a team sport. So he can’t do it by himself. Luckily today, he was able to give us the win, but with the team being behind him and helping him out,” said Assistant Coach Ricardo Raygoza. The Huskies went down by a goal five minutes into the second half of a Compton corner kick. Compton freshman forward Jose Rodriguez crossed the ball toward the center of the goalkeeper box and freshman forward Alfredo Trujillo was left open to head in the first goal of the game. “We’re still having trouble with set pieces. I think we’re not marking our man until the end of the play and that cost us big,” said Raygoza. Compton had more possession of the ball, but the Huskies responded five minutes later. ELAC freshman midfielder Andres Aceves took the ball to the left side of the field where he crossed the ball in and freshman forward Paulo Macedo Nahashique controlled the ball with his chest and smashed the ball to tie the game. Even though the Huskies won, Head Coach Eddie Flores said he believes they have a lot of areas they need to improve, including scoring on one-on-ones encounters. “I’m happy with the score, but I’m not happy with how the score came about. We could’ve scored more goals, and we didn’t… A better team is going to make us pay. I don’t take anything away from Compton because all around it was an even game,” said Flores. The Huskies finished with 11 shots, six of them on target. 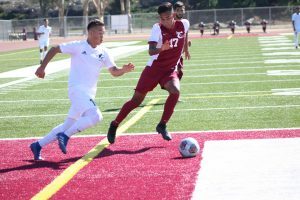 Three minutes before the first half ended, Compton had a chance to take the lead, but ELAC freshman goalkeeper Horacio Aguirre made a double save to keep the score at zero. Aguirre blocked a one-on-one against Trujillo, then blocked a rebound shot from freshman forward Sedale Butler. ELAC’s next game will be an away game Friday at 6 p.m. against Rio Hondo College in another SCC-North match.